Adhering to a strict cleaning regime is an important step on the road towards consistent accuracy. Rifle cleaning procedures, including the removal of powder and metallic fouling from barrels, have advanced in recent years. Improvements have, for the most part, arrived in the form of chemicals which actually do what they are supposed to do. Please be aware that powder solvents often do not remove copper fouling from barrels. Although there are exceptions, the amount of fouling in a barrel is, in general, proportional to the surface finish. A well-used or neglected production grade barrel with some erosion & pitting will collect more copper than a well maintained select match-grade custom barrel, providing all other factors such as bullet type and velocity are equal. In order to clean effectively, there is a certain amount of equipment which is essential. Over and above this there are other products available which either make the job more pleasant, efficient or protect parts of the rifle such as the bedding during cleaning. Before cleaning begins, the rifle must be supported in some fashion, with the muzzle pointing downwards to let excess solvents run out, while keeping both hands free. A wooden frame or vice can serve well, alternatively, proprietary “cradles” are now available from various sources. A plastic coated cleaning rod such as a Parker Hale of the correct size and length, i.e. as short as possible for the barrel length, is essential. Two rods save a little time and effort. Good quality solid steel rods are available and the decision between plastic coated and steel is up to the individual shooter. Next to the cleaning rod, the most important item is a good bore guide which fits closely inside the action and rear-end of the chamber. Those which have a rubber O ring to seal the chamber prevent a lot of solvent from running down through the action bolt holes and into the bedding. The bore-guide should protrude far enough from the rear of the action to stop dripping solvents from running into the bedding via the tang. The primary function of the boreguide is to align the cleaning rod with the bore thus preventing brushes and jags from gouging into the chamber or throat and avoiding damage to the rifling while cleaning. Spear tip jags and cut patches are much better than traditional serrated jags and wound Four-by-Two. I prefer not to pull dirty patches back through the barrel if possible. Good cotton patches are absorbent and fit well when used with the correct size of jag. They are also much simpler to use. If you use bronze brushes make sure that they are of good quality with a brass core. These brushes are generally cheaper than the inferior, steel cored ones anyway. Discussions on solvent types and their effectiveness often come to no definite conclusion as personal preference usually prevails. The main types of powder solvents such as Parker Hale 009 and Hoppes No. 9 will remove very little, if any, copper. Specialist copper solvents such as Hoppes Benchrest, Butch’s Bore Shine, Tipton, Sweet’s and Shooters Choice Copper Remover all serve the purpose. Both Sweets and Shooters Choice Copper Remover have strong ammonia bases and if not used with care can etch the surface of stainless steel barrels. I don’t recommend leaving strong, ammonia based products in stainless barrels for long periods. I usually find that unless the barrel is badly fouled that Butch’s or Tipton do a satisfactory job. The third group of cleaners are the abrasives such as JB Compound or RemClean. Despite what it says on the outside of the package these products are abrasive and careless use can easily put excessive wear on the throat or crown of a barrel. However, they do a very good job of removing metallic fouling. Please use only small quantities while carefully avoiding any concentration of its use at either the muzzle or the throat. 1. Push a loose patch soaked in copper solvent through the barrel – this wets the bore and removes any loose powder fouling – repeat this until the patches no longer come out looking black, usually twice is enough. 2. Leave the solvent in for 5 – 10 minutes and patch out with clean tight patches. If the patches have blue copper deposits on them then either repeat stage 1 or go on to using a bronze brush depending on how much copper is appearing. Before brushing, give some thought to protecting the objective lens of your scope as solvent vapour on this does nothing to improve its performance. 3. Push a wet brush through the barrel and completely out of the muzzle. It’s best not to dip the brush into the solvent bottle as this will contaminate the solvent; use a dispenser bottle instead. Don’t pull the brush back through the barrel while any bristles remain inside the bore. Good quality phosphor-bronze brushes should not damage the crown but care should be exercised while using them i.e. when entering the brush at each end of the stroke. I use roughly one cleaning stroke per shot since the last cleaning session, this is normally between 15 & 20 strokes then patch out the barrel with clean, dry patches. This task should be repeated if the patches are still coming out blue or copper coloured. It’s obvious that the copper solvents are going to react with the copper in the bronze brush and leave small traces of blue colouring but this is nothing in comparison with bullet jacket fouling. If two attempts at brushing do not remove the copper then more intensive measures such JB Compound may be necessary. 4. To apply the JB Compound, wrap a Parker Hale type serrated jag with strong tissue paper & ensure that it’s a tight fit in the bore. Evenly apply a small quantity of JB to the patch and run it back and forth in the bore approx. twelve to fifteen times. In order to minimise damage from the abrasive try not to let the patch completely exit the bore at either end of the barrel. After the first application, patch out the bore with solvent soaked and dry patches then check for remaining copper near the muzzle. This is most easily accomplished by leaving a jag approximately one inch from the muzzle and with the aid of good light look onto the rifling for traces of copper. If copper is easily visible then repeat the process with JB. Always clean the bore well with both wet and dry patches after using an abrasive cleaner. Presuming that all has gone according to plan and the patches are coming out clean, remove the bore guide and swab out the chamber with some tissue paper on a jag or stick to remove dirt and excess solvents. 5. Care should be taken to clean out the bolt lug recess or dirt trapped in this area will lead to galling of the bolt lugs and action. Action cleaning kits are available which are designed to make this job easier with the aid of cotton dental swabs. dental swabs. 6. 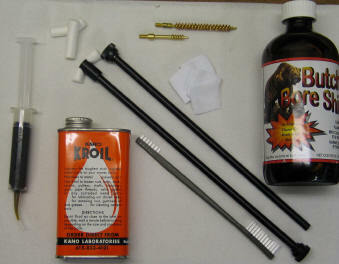 Apply a small amount of high quality grease to the back of each of the bolt lugs. I am not a fan of oiling and greasing rifle parts unless for protection while not in use but I feel this is important in order to prevent the lugs from galling. Do not lubricate the trigger mechanism except with a dry lubricant if necessary. Triggers should be operated clean and dry as grease and oil only serve to attract and hold dirt. Finally, thought should be given to caring for all wooden stocks. A rifle will maintain its point of impact and accuracy in a more consistent fashion if the stock stays stable. This not only means excluding water from the stock but also avoiding large variations in humidity and temperature over a short period of time. The common stock finishes such as oil and varnish work perfectly well providing they are maintained. As with most mechanical objects the performance of a custom rifle will depend upon it being kept well maintained. Apart from cleaning the bore, described elsewhere, several other operations and checks should be completed on a regular basis. Muzzle Brakes / Sound Moderators. Always remove muzzle accessories prior to cleaning or after each shooting session in wet weather. There appears to be a large increase in pitted muzzles and along the last three or four inches of the bore, since moderator use became commonplace. Large amounts of fouling will build up on the crown and should be removed in order to prevent corrosion. A phosphor bronze bore brush and copper solvent will help remove fouling. A small amount of grease should be applied to the threads prior to refitting the brake or moderator. Chamber Cleaning. This can be completed with an action cleaning kit and a little heavy tissue paper. By wrapping the tissue around a bore brush, pushing it into the chamber and gently turning it any surplus solvents or foreign material will be removed. Locking Lug Recess. Where the bolt lugs lock into in the action is difficult to access and yet very important to clean. This area provides a collection point for material which will get between the bolt lugs and the action. At best this will reduce accuracy but it can also lead to galling or tearing of the bolt lugs at which point the lugs will no longer bare evenly. An action cleaning kit with cotton dental rolls should be used to clean out any accumulated dirt. Bolt Lugs. The bolt lugs should be wiped off and lubricated every time the rifle is used. Use a very small quantity of good quality, light grease on the rear or bearing surface. This is best applied with a syringe and will help prevent galling of the lugs. Cocking Cam. At the rear of the bolt, on the underside, a cam which is intended for cocking the rifle will be found. The contact surface of the cam withstands the pressure of the firing pin being cocked each time the bolt is opened on a fired rifle. Applying a small quantity of grease to this area will aid smooth operation and reduced wear. Firing Pin Assembly. 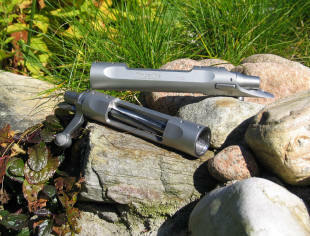 Using a firing pin removal tool the firing pin assembly is easily removed from almost any rifle. This splits the bolt into component parts for easy cleaning. It is advisable to remove tension from the firing pin when the rifle is not in use for long periods. A consistent firing pin strike on the primer is critical for best accuracy and in order to achieve this the inside of the bolt should be kept clean. Please don’t pack it full of grease as this will only impair a consistent strike. Light oiling should be sufficient to ensure no corrosion takes place around the firing pin. Bedding. With the exception of glue-in benchrest rifles the barrel and action should be removed from the bedding system when it gets wet. Water trapped between the action and bedding will cause elevation problems. No matter how close a fit the bedding is capillary action will draw water under the action and, compared with a conventional wooden stock, it is unlikely to evaporate. It is likely to lead to oxidisation of either or both of the action and metallic component within the bedding epoxy. Care should be taken when removing the action not to damage the bedding. It should be lifted vertically away form the bedding until the recoil lug clears the stock. Dry off the bedding of any water, solvents and dust and carefully replace the metalwork. Screw Tension. On replacing an action when a rifle has been dis-assembled it is important to put the correct tension on the bedding screws. The actual torque should not be critical but it is important that the action is held firmly in the bedding. Where stainless steel screws are used with a stainless action a small amount of grease should be applied to the screw thread in order to prevent galling.